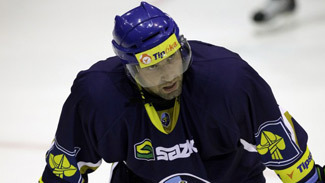 Within Czech hockey circles, former NHL forward Jan Hlavac is most associated with the famed HC Sparta Prague club. That is where the Prague native got his start in the sport and rose to prominence before heading to North America to play in the NHL. Upon returning to Europe following a 436-game NHL career with the New York Rangers (two stints), Philadelphia Flyers, Vancouver Canucks, Tampa Bay Lightning and Nashville Predators, Hlavac played all or parts of three other seasons with Sparta. From 2008-09 to 2011-12, Hlavac primarily played for Swedish Elitserien team Linkopings HC, where he enjoyed a pair of prolific scoring seasons and two less dominant but still solid campaigns. More recently, Hlavac has forged a relationship with a different team in his Czech homeland: HC Rytiri Kladno (the Kladno Knights), owned by his friend and former Rangers teammate Jaromir Jagr. Hlavac spent the first 11 games of the 2011-12 Czech Extraliga season with Kladno on loan from Linköping. Now the 36-year-old Hlavac is back with Kladno, and he may remain for the entire season. "Last year I was very happy in Kladno and I liked it here," Hlavac said to the team's official Web site. "So we agreed to come back again and I think both sides are happy … I watched Czech TV regularly, whenever I could grab it, when I was in Sweden. I saw a lot of (Czech league) games and I think that people here in Kladno had to be happy with the Knights' results. It was a good year for them. A lot of new guys helped win a spot in the preliminary round of the playoffs. I think it was a great success." Hlavac's contract arrangement with Kladno for next season is essentially the same as it was last year: He will open the year with Jagr's team and is free to leave if and when he has the opportunity for a higher-paying contract in another league. In each of the final three years of Hlavac's stint with Linkoping, he began the season with a Czech club (the Liberec White Tigers in 2009-10, Sparta in 2010-11 and then Kladno) before re-joining the Swedish team. This arrangement was created to avoid Swedish taxation laws, and enabled Hlavac to play for LHC without owing the Swedish government taxes on his salary. Hlavac does not presently figure to return to Linkoping at any point next season. He had a bit of a down season (10 goals, 23 points in 37 games) for a team that opened the year expecting to be a playoff contender but finished 10th and missed the postseason. "The season was a failure and there was a crisis with the club," he said. "It was our worst season, and not much really went right. We played a defensive style that didn't fit the team. Sometimes all clubs go through those sorts of things, even the quality ones. At least we avoided the relegation round." Hlavac has not ruled out signing with another team outside the Czech Republic -- most likely in the KHL, Elitserien or Swiss National League -- at some point next season. However, he has also maintained spending the entire season with the Knights would be an attractive option. Hlavac claims he turned down offers from several other Extraliga clubs to come back to Kladno, and the negotiation with the Knights was completed quickly because they were his top choice within his home country. "I would love to spend an entire season with Kladno, and it may be this season," Hlavac said to Kladenske Listy. "I still intend to play outside the Extraliga again, but I have nothing else arranged now. So I could be a Knight all season, and that would be great." Last season, Hlavac's presence in the Knights' lineup early in the season gave the club a much-needed scoring threat on the wing. 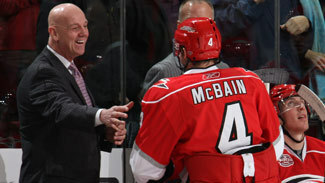 He generally played on a line centered by 40-year-old veteran Pavel Patera. Hlavac bolstered an attack led by the likes of Jiri Bicek and Kladno mainstay Jaroslav Kalla (the team's leading scorer). A club that had been in danger of relegation from the Extraliga and had been on the brink of bankruptcy until Jagr helped rescue it by taking over majority ownership found itself challenging for a top-three spot in the standings through the first six weeks of the regular season. Eventually, Kladno leveled off and dropped to ninth-place in the final regular season standings. However, this was still good enough to earn a spot in the preliminary round of the Extraliga playoffs. The club's winning record (24-21-7) also represented a major improvement from recent seasons, in which Kladno annually finished last or next-to-last in the league. Hlavac believes that Kladno can build on its success from last season and challenge for a guaranteed spot in the playoff quarterfinals. The team is presently about halfway through its 12-game preseason schedule. Most recently, the Knights defeated HC Pardubice on the road by a 5-1 count and then dropped a 5-2 decision to HC Litvinov the following evening. The regular season gets underway on Sept. 9 with a home match against Liberec. As a player who literally grew up as a member of HC Sparta, playing his way up through its junior system as a teenager and staying with its senior team until he was nearly 23 years old, Hlavac admits that he still has some sentimental attachment to Sparta. He maintains a home in Prague and is not looking for a place in Kladno. Nevertheless, he began to forge ties to the Knights last year and the team began to occupy a similarly fond place in his heart even when he left for Sweden last season. "It's in me about half and half," Hlavac said to Kladenske Listy. "But slowly, [Kladno] has begun to outweigh the positive memories with Sparta. Even so, I spent so many years with Sparta that I can't just delete it."